I was originally going to publish this review on the date of the book’s release but I just couldn’t wait! I have taken my time reading this book and really gave myself the opportunity to take it all in. Once I read the first twenty pages, I started thinking about how to best describe the feeling that this book gives you. The one word that keeps coming to mind just doesn’t do the feeling justice – romance. I’m not talking about the traditional thoughts that the word romance conjures (candlelit dinner for two at a street café in Paris or an elaborately planned proposal at the top of the Empire State Building). Bear with me while I try to explain. Everything in his dreamy description is just on such an unbelievably grand scale. The first twenty pages of this book completely and totally set the stage for the feel of the characters and the story. More so than any other book I have ever read. Then comes the Wolf Gift….and our dear Reuben’s whole world changes. Stuck in the middle of an emotionally draining moral dilemma, lost in his new grey area between right and wrong, Reuben is unsure if he’s a monster or a hero…or just monstrously heroic. Watching this character struggle on his own through all of the changes that are overtaking him, I found myself just wanting to reach into the book and give the poor guy a hug!! Reuben brings a whole new meaning to the word ‘vigilante’ and rather than abhorring him for it, you want to throw him a pep rally! Encourage him!! Be his cheerleader!!! This book has an amazing cast of characters. I’ve already expressed my adoration for Reuben. He’s fantastically written and makes me desperately wish that I viewed the world through his eyes. I believe that if everyone stopped to really see the beautiful things in life – allow the majestic to absolutely take our breath away – instead of focusing on all of the horrible and the negative, we would all live in a much better world. I envy Reuben’s ability to view things that way. Felix is a man who has had the chance to travel the world and take in all it’s wonders. Judging by the contents of his home that he left behind, this is a man that has lead a genuinely rich existence. Again, with the envy. *wink wink* In his own way, he is very much like Reuben and I think that this is part of the reason that Reuben becomes so enamored with Nideck Point. Kindred spirits who would both be instantly taken with the estate. Grace and Phil are Rueben’s parents. Phil is most definitely Reuben’s father. He’s a poet at heart and an artist to the bone. The interactions that these two characters have make me smile. While I was reading this book, every time Grace (Reuben’s mother) came into the picture, all I could picture was Ellis Grey. If any of you out there are Grey’s Anatomy fans, I am talking about Meredith Grey’s mom – the brilliant surgeon. Beautiful, intelligent, calculated and always looking for the science in things. Approaches everything with realism. She’s not a day dreamer and she’s not a romantic but these things don’t take away from the character. She shines bright in her own way. Jim is Reuben’s brother and he’s just a sweetheart. He has his own struggle to deal with. However, it was a struggle that he took on willingly and I don’t believe that he regrets it for a moment. I admire that in him. Of course, there is a big long list of characters that we could go over and they are all fabulous for very different reasons but I am afraid that I will leak too much info if I get into why I love each and every one of them. So I will stop there with the character gushing. Now, what good would all of this be without some mystery to the tale? The Wolf Gift is very well woven with many different mysteries. The clues are there but written in such a way that you can’t simply guess what is going to happen half way through. Trust me. You think you have it all figured out at the mid-way point but you could not be more wrong. Just sit back with your coffee and your book and enjoy the ride. What a ride it is! I had a little bit of trouble categorizing this book in my mind. When I told people what I was reading, I felt like it was an injustice to say that it is a “werewolf book”. The story of The Wolf Gift is so much more than that. The Wolf Gift has action & adventure (in the Indiana Jones sense of the word), love & romance, legend & myth, terror & fear, primal carnage, humor, and so much more. Overall I give The Wolf Gift 5 incredibly enthusiastic stars! I can honestly say with a 100% clear conscience that there wasn’t a single thing that I disliked about this book. The Wolf Gift was just amazing and I will be re-reading it many times in my life, without a doubt. I am not positive if this is the beginning of a series (that will be in my upcoming interview with Anne) but I have a sneaking suspicion that it is. Although the story wrapped up nicely, there are some things left open that would most definitely work for a much-welcomed sequel in my eyes. I have my crossables crossed that we will be seeing more of Reuben. Pre-Order Your Copy of The Wolf Gift From Amazon.com! 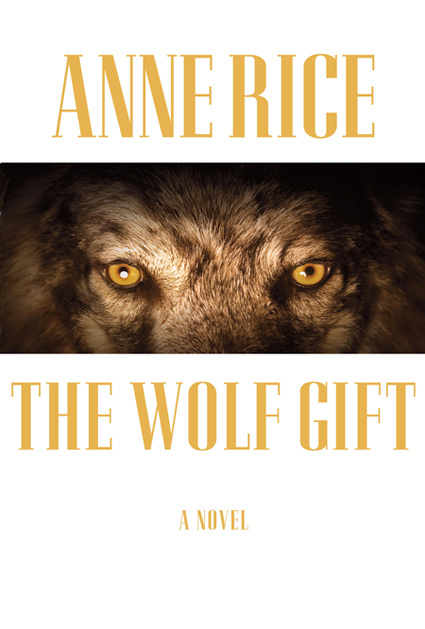 Dont forget that Anne is doing a book tour to celebrate the release of The Wolf Gift. Click here to see the dates! Also, my interview with Anne Rice will be coming on Feb 14th! and by review I mean book… obviously I read the review since I got to the bit at the end where you mention the interview. Ok… I’m just going to go sit quietly now facing the corner. I think it’s best for everyone. Ginny, my oldest son wants to marry Jena just for her Anne Rice books and now this connection. lmao! Well, although I am flattered, I am already married. lol 😉 Ginny – read the book. For real. Read it. lol It’s incredible. It took me several days of putting this review together because I had SO much to say and I kept having to trim it back because I was giving out spoilers left and right. Read the book. lol READ IT! lol Bee tee dubbz – who do YOU want to interview??? E-mail me! Ordering this book now! Thanks!